Extra! Extra! 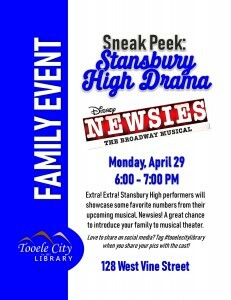 Stansbury High School performers will showcase some of their favorite numbers from their upcoming musical, Newsies! Love to share on social media? Tag #tooelecitylibrary when you share your pics with the cast! A great night to introduce your family to musical theater and local talent.